Poor Lightning Returns: Final Fantasy XIII. It seems most people had made up their minds about it before it was even released! After all, its direct predecessors, Final Fantasy XIII and Final Fantasy XIII-2 were both games that fell below par—though that may only be because of how high the bar had been set over the decades in which Final Fantasy represented the best in role playing games. Beyond that, Square Enix decided to do things differently this time around by making Lightning’s adventure a solo one; a first for the series. Even the original Final Fantasy on NES allowed the player a party of four Light Warriors. Lightning Returns is also much less linear than previous games in the series, and features an open world with an abundance of side quests which could alienate fans used to the linear nature of the series. And perhaps the deathblow was that the game contained a persistent time limit that would affect how players could play the game, a pet peeve of many. Any one of these reasons could explain the low review scores that are popping up all over the internet, and it seems the 8s and 7s have been entirely drowned out by 6s, 5s and (gasp) 4s, to the point that Lightning Returns is actually averaging less than 70% on Metacritic, which in my opinion, is quite ridiculous. Based on these scores, it’s understandable that even some diehard fans are staying away, but it’s also a shame. The 7s and 8s got it right. Lightning Returns: Final Fantasy XIII is a good game, with an exciting battle engine, a beautiful and diverse open world, great music and plenty of fun gameplay. It won’t win over those that disliked its predecessors, but it will certainly entertain those that have enjoyed Final Fantasy XIII and Final Fantasy XIII-2 and are ready to see how the story ends. 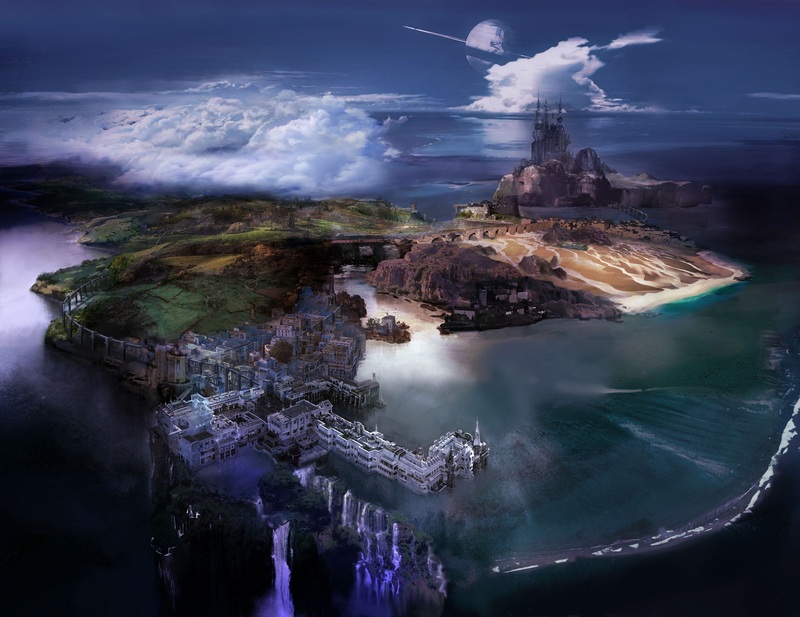 Nova Chrysalia, the last land of a dying world, and setting of Lightning Returns: Final Fantasy XIII. Lightning Returns: Final Fantasy XIII takes place 500 years later than the ending of Final Fantasy XIII-2. Waking from a crystal sleep, Lightning finds herself facing the final days of the world. Her awakener, the god of light, Bhunivelze, dubs her the savior and tasks her with saving the souls of the remaining humans before he creates a brand new world and the existing world is destroyed. For her cooperation, Bhunivelze has promised Lightning that she will be reunited with her sister, Serah, when the job is complete. The world itself, Nova Chrysalia, is being eaten away by a mysterious energy called Chaos, and by the time Lightning begins her mission, only four regions remain. There’s Luxerion, City of Light, a holy city where most of the residents are devoted to Bhunivelze, but it is not the only great city remaining. There is also Yusnaan, which is as different from Luxerion as possible. Its citizens spend their days in revelry, enjoying battles at the Slaughterhouse arena, feasting in the Glutton’s Quarter and dancing each and every night away. Outside the cities are the Wildlands, home to forests, fields and farmers, and the Dead Dunes, a desolate desert of danger, where bandits plunder ancient ruins in search of treasure and fortune. These four regions are all that remains of Nova Chrysalia; the rest of the world is blanketed in Chaos. Despite the centuries that have passed, Lightning will encounter many familiar faces during her travels. I won’t reveal specifically how it is that they have survived all this time, but I will say that fans of the series will be satisfied by the reappearance of many of their favorite characters. They play crucial roles in each of the game’s 5 lengthy main story quests, providing plenty of nostalgia and a welcome opportunity to add some extra emotional weight to the storyline—something it desperately needs considering much of the player’s time will be spent completing side quests that usually involve new, less interesting characters. 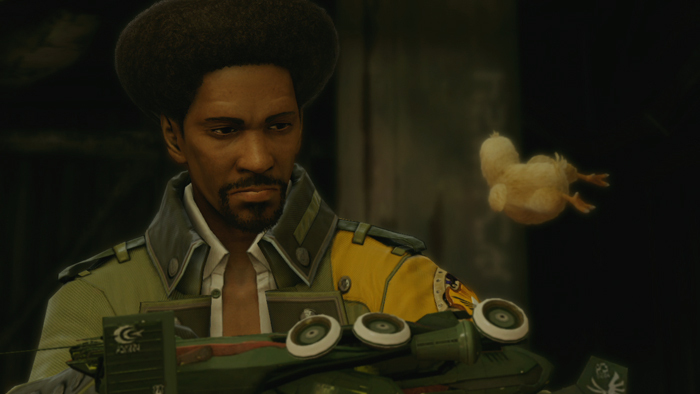 Sazh makes an appearance in Lightning Returns, complete with the chocobo chick that nests in his afro. But whether those characters are interesting or not, their souls still need saving, and Lightning is the only one that can save them. She does this, quite simply, by granting their wishes, and those wishes come in great variety. Yes, there are some simple and cliché objectives—one literally has you fetching a lost ball for a kid—but most of them are more detailed and interesting than that. A better example of a fetch quest involves acquiring medicine for a girl’s sick father. Lightning has to find out where to buy the medicine, but it isn’t that simple. After finding the right shop, it turns out that they are out of the necessary ingredients, so the player has to acquire them. The game doesn’t tell the player exactly how to do this, so there is a certain degree of real exploration (or googling) in the questing. There is far more to it than just following waypoints and that makes the side quests generally fun and interesting to complete. Granted, some of the solutions may be a bit too obscure, but for the most part, I enjoyed the time I spent completing these quests. Beyond the 5 main quests and over 60 side quests, there are even more souls to save. And since completing quests rewards the player with improved stats for Lightning as well as monetary rewards and items, there is plenty of motive to complete as many of them as possible. Through an object called the Canvas of Prayers, Lightning can read the prayers of the people of Nova Chrysalia. This is where the majority of the “collect” quests are found. Over 80 prayers appear on the canvas throughout the game, and most of them can be completed by turning in a pile of monster parts or rare objects. The good news is these can be completed at any time, and the items that need to be collected can be found and picked up regardless of whether or not the quest has been accepted. Even better, the quest items have a 100% drop rate if they have to be acquired from defeated monsters. And best of all, in many cases, you will acquire the items naturally while completing the main quests and side quests. Only a few Canvas of Prayers objectives will require spending additional time hunting for monsters. The Reavers, behemoths of Nova Chrysalia, are running rampant. Wipe them out. All of them. 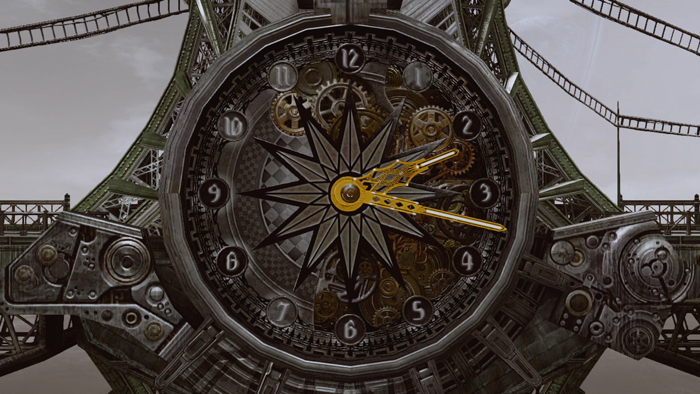 Time is always a factor in Lightning Returns: Final Fantasy XIII. The game includes a day/night cycle where every 3 seconds of real time is a minute of in game time, or 72 real minutes per in-game day, with the clock pausing for combat and storyline sequences. Shortly after the game begins it is revealed that there are only 7 days left until the world will end, but by completing quests and saving souls, Lightning can buy more time—additional days. This particular aspect of the game is heavily criticized, as time limits and role playing games don’t generally go together very well. Naturally, players like to be able to take their time exploring in this type of game, and a persistent clock with a doomsday countdown on it doesn’t lend itself to casual exploration. To make matters worse, many quests objectives are dependent on what time it is, so it can easily be frustrating when you want to do something, but you have to wait several hours before it is even possible. Beyond that, given the open world nature of the game, it’s not unusual to get a little bit lost. You might find yourself wasting time searching for quest objectives somewhat aimlessly. All I can say is it’s not as bad as it seems. I just wish I had known that before I started playing. I was so concerned about running out of time (especially with how often the game reminds you of how little time you have) that I came up with a few different methods of maximizing my efficiency for each day. I got out a notepad and wrote up a schedule, keeping careful track of which quests were time-sensitive and which quests I should group together. I reset the game dozens of times so that I could complete an objective faster, and even rolled back to earlier save files a couple of times when I felt like I could have done an entire day better. I shouldn’t have bothered. I ended up completing all 5 main story quests and 99% of the side quests and Canvas of Prayers objectives in the entire game within the first 5 days. I had extended the number of days until the world would end by the maximum number and I had more time than I knew what to do with. I ended up going to an inn and sleeping through more in-game time than it took me to get everything done. I managed this by making excessive use of one of Lightning’s abilities. It’s called Chronostasis, and it stops the clock completely for a minute or two. It consumes 2 EP, which are kind of like magic points in other games, but which can only be restored by fighting enemies or by using Ethers (which are kind of rare). Still, once I got acclimated to the game, it wasn’t hard for me to turn what would normally be a 72 minute day into 4 or 5 hours of focused questing by fighting a few monsters and keeping the clock perpetually paused. But even without my obsessive time management, there is plenty of time to finish the main quests and the majority of the side quests before time runs out, as long as you understand how to utilize Chronostasis and which monsters can earn you the most EP (hint: it’s the big ones). Though time is always of the essence, with a little effort and planning it is hardly an issue at all. 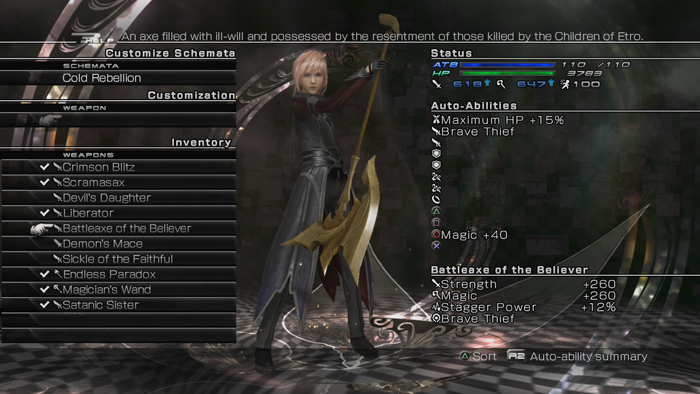 Since keeping the clock stopped comes down to earning EP in combat, it’s fortunate that Lightning Returns: Final Fantasy XIII has a very enjoyable battle engine, and a great system for preparing her for combat. The fights themselves aren’t that dissimilar from the previous games in the trilogy. You still have to stagger enemies in order to lower their defenses, and there are different methods of successfully staggering, be it attacking repeatedly with physical attacks or magic, striking a weak point, or attacking at a precise moment. And like before, you still switch between three different equipped classes, with some classes serving specific purposes like improving defense, debuffing or staggering. And once again, you can use abilities repeatedly until you run out of ATB (active time battle) points. But the devil’s in the details, as there are a variety of differences this time around as well. As I mentioned before, you control only Lightning instead of a party of characters and now you can manually move her around the battlefield. This freedom of movement doesn’t actually affect combat that much since most of the time you will be charging up to the enemies swinging your sword around, but once in a while a strategic opportunity presents itself where backing away from the enemy works to your advantage, causing an opponent to miss an attack. Another significant change is that the game awards precise timing. If you activate your next physical attack right as the last attack strikes, or cast a spell just as the last spell was cast, your attacks will be more effective. Likewise, if you have a guarding ability equipped, activating your defense at the last possible second can greatly reduce or even nullify damage entirely, even from the strongest attacks in the game. I particularly liked this aspect of Lightning Returns, as it forced me to really pay attention during combat and to learn the enemy attack patterns. Finally, each schema (class) you have equipped has its own ATB gauge, so when one empties, you can switch to the next and continue attacking or defending. The ATB gauges recover more quickly for inactive schemata. It’s possible (and often quite useful) to string a combination of attacks together that utilize two or even all three equipped schemata! For example, you might have one class with a fully charged ATB gauge, but your big finisher is on another schema, that is nearly empty. You can use the first schema to start a combo—which gives the other gauges some time to charge—and then switch to the second schema for the final, powerful hit. While this system of managing three ATB gauges can be a bit confusing at first (and even frustrating when all you want to do is attack but instead you get a buzzing noise because your gauge is empty), I eventually grew to really love the system and its strategic implications. Between resource management, precise timing, and balancing between offense and defense, battles are frantic and exciting, especially against bosses or groups of enemies. And every battle lost is a lesson learned, forcing the player to go back to the drawing board to build some better schemata. With that battleaxe, I’d be a believer too. Each schema is made up of several parts. The main component is the garb, which not only completely changes what Lightning is wearing, but also changes her abilities in a variety of ways. There can be basic stat adjustments, like more HP or Strength, and there are always bonuses or penalties to the ATB gauge, such as the maximum number of points it can have, how full it is at the start of battle and how fast it refills. Beyond that, the various garb usually come with specific abilities attached to one or more of the face buttons on the controller. For example, the Black Mage garb comes with Rapid Fire and Quick Freeze already assigned to two of the ability slots. The other two can be filled manually by the player from a list of collected abilities. Multiple copies of the same ability can be combined to produce a stronger version of the ability, and later in the game, abilities can even be leveled up. Abilities can also contain additional bonuses and passive abilities, further diversifying Lightning’s combat potential. In addition to the garb and ability slots, each of the schemata are further customizable with a weapon, a shield, an accessory for the head and an accessory for the arms. As you can imagine, putting together an effective combination of garb, equipment and abilities is both challenging and rewarding. But the greater challenge is coming up with a good trio of schemata to switch between in combat. There are enough significantly difficult battles in the game to justify spending a lot of time tinkering in the menus, but there is another motivation as well for a certain demographic: playing dress-up. 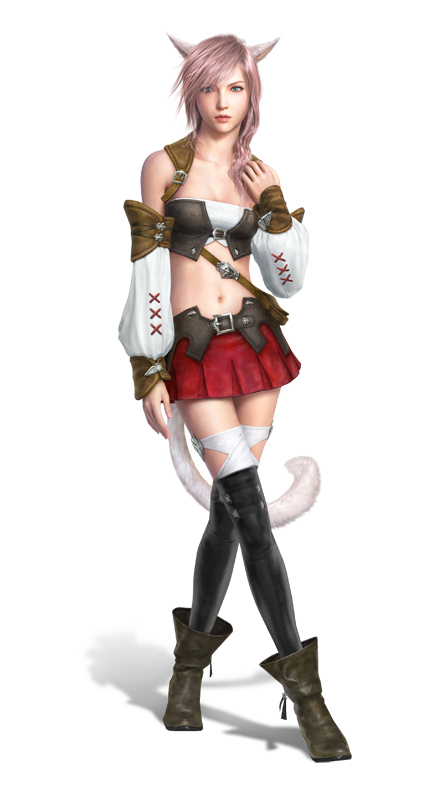 There are nearly a hundred garbs in Lightning Returns: Final Fantasy XIII, and they range from badass to scandalous. Lightning will wear everything from a full set of Dark Knight plate mail to the Watery Chorus garb, which consists of little more than a bikini. There is enough fan service here to satisfy the most obsessive Lightning fans, but that could just as easily annoy those looking to take Lightning Returns particularly seriously—especially considering she appears as equipped during storyline sequences. That can completely kill the mood. 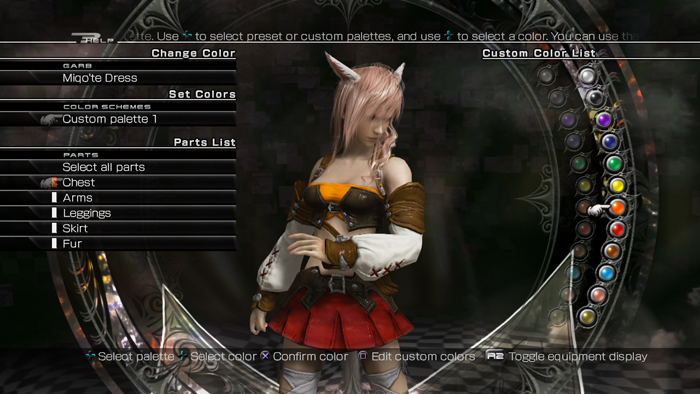 For better or worse, Lightning has become a dress-up doll. You can even change the colors of individual pieces of each outfit, and equip an adornment for added flair. These range from simple hats and glasses to cat ears and tails. You can go so far as to put an afro on her head or an electric guitar on her back. Though I suppose if you’re going to save every soul in the world, you might as well look good doing it. Don’t let her whimsical exterior fool you, Lightning is still every bit the character you know and love (or hate). Once you have mastered customizing your schemata and are prepared to take on the world (or make a fashion statement at the very least), the enemies will crumble beneath your sword. In fact, you can even drive them to the point of extinction. Unlike the great majority of RPGs that exist today, the monsters in Lightning Returns: Final Fantasy XIII are finite. Depending on the size of the enemy, there can be anywhere from 15 to 120 of them scattered across Nova Chrysalia (with one unusual exception). The last surviving monster of any given species is called a Last One. The Last Ones are much more powerful than standard enemies, but provide more significant rewards for defeating them as well. Once a Last One has been defeated, you will not encounter that enemy type for the rest of the game. It is actually possible to rid the entire world of monsters (and there is even a quest to do so). Fighting the Last Ones representing the more difficult monsters in the game is no joke, and even some of the less threatening species put up a hell of a fight. This is especially true if you wait until the last day to fight them. 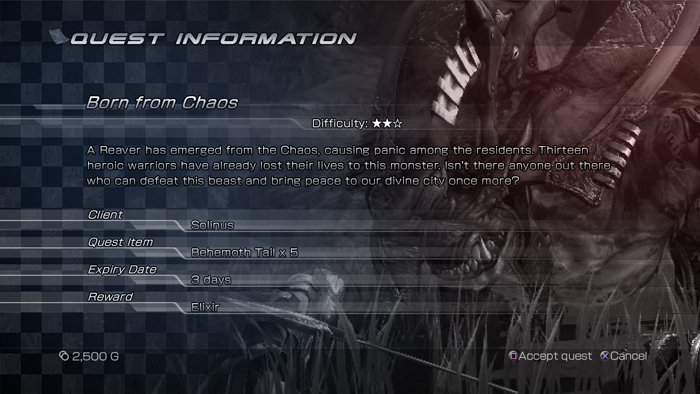 The monsters in Lightning Returns become more powerful the closer the world comes to its end. If you actually do plan on wiping out every single monster throughout Nova Chrysalia, you might want to wait until after you complete the game. Lightning Returns: Final Fantasy XIII features New Game+, which allows you to begin a new game while keeping the vast majority of your abilities and items. It also allows you to select the Hard difficulty, which is more appropriate for a second playthrough. While playing on New Game+, reacquiring garbs and accessories does not put a second copy of them into your inventory. Instead, it improves the item, strengthening it, and in the case of garbs, leveling up the skills they come with. Beyond that, New Game+ features an entirely new crafting system that allows the player to strengthen weapons and shields, choosing which specific parameters to improve and significantly increasing their power and usefulness. Completing quests again in New Game+ also continues to increase Lightning’s stats. There is even a “Limit Break” option that allows her stats to exceed the normal maximum growth parameters, for players that want to play through the game several times and become absolutely unstoppable. With enough crafting, questing and carefully customizing schemata, even the most notorious of the Last Ones will fall, and if that isn’t enough, there are a couple of optional end-game battles as well. New Game+ also contains several garb and pieces of equipment that can’t be acquired during the first playthrough. It’s safe to say that Lightning Returns: Final Fantasy XIII contains enough post-game content to keep dedicated players occupied long after finishing the game for the first time. 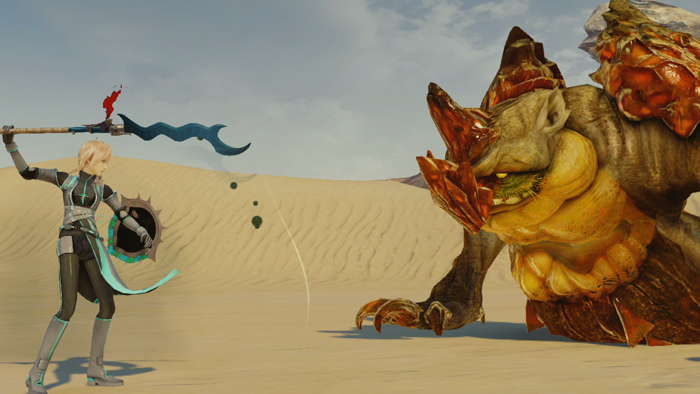 Earth Eaters and Chocobo Eaters are a couple of the most notorious enemies in the game. Don’t fear them, destroy them! Every single last one of them. Seriously, Chocobo Eaters are evil. I hate those things. When all is said and done, there is a lot to like about Lightning Returns: Final Fantasy XIII. Though many of the criticisms against it are reasonable to a degree, they are also frequently blown out of proportion. The time limit is not nearly as bad as it seems, the open world is actually quite fun to explore, and even the storyline has its moments. It certainly isn’t the best tale ever woven in the series, and the non-linear nature of the game can disrupt the pacing of the story. But at the same time, the side quests do a lot to flesh out the setting and lore. For those that have been paying close attention through Final Fantasy XIII and Final Fantasy XIII-2, Lightning Returns wraps things up nicely while allowing us to spend a bit more time with our favorite characters. More importantly, the game has a strong battle engine with excellent customization options in the schemata system, and plenty of worthy challenges to stress its limits. The music is fantastic, even if the voices leave something to be desired—though I should note that you can download the Japanese voices from PlayStation Network if you would prefer to listen to those. There is also plenty of post-game content, further increasing the value of the product. Overall, Lightning Returns is a solid RPG, and one that, in my opinion, is worthy of far more respect than it has received thus far. Like the other games in the trilogy, it falls short of the best games of the series, but it still stands tall enough on its own to be worth playing. If you have played through the first two games in the trilogy, I highly recommend giving Lightning Returns: Final Fantasy XIII a try. 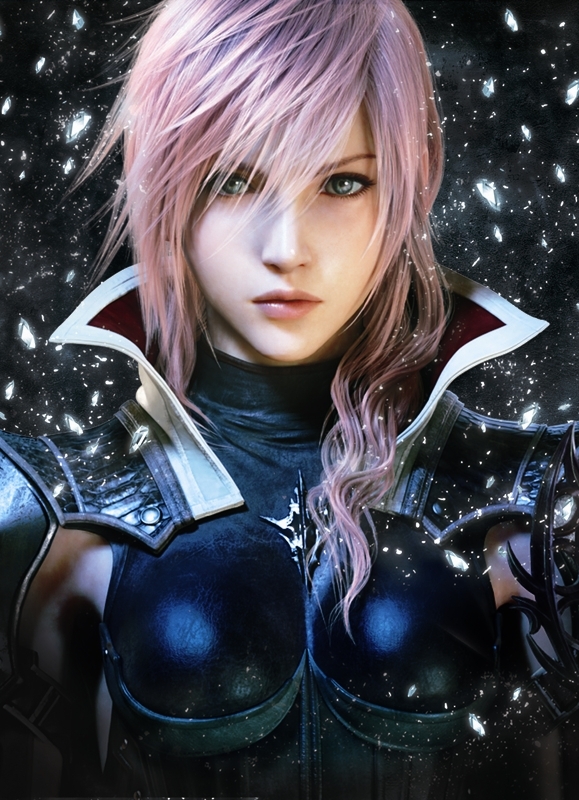 Ari finished Lightning Returns: Final Fantasy XIII in 58 hours, having completed nearly all of the game’s side quests. He was not provided with a copy of the game for review purposes.